Proxima Centauri (from Latin, meaning 'nearest [star] of Centaurus'), or Alpha Centauri C, is a red dwarf, a small low-mass star, about 4.244 light-years (1.301 pc) from the Sun in the constellation of Centaurus. It was discovered in 1915 by Robert Innes and is the nearest-known star to the Sun. With a quiescent apparent magnitude of 11.13, it is too faint to be seen with the naked eye. Proxima Centauri forms a third component of the Alpha Centauri system, currently with a separation of about 12,950 AU (1.94 trillion km) and an orbital period of 550,000 years. At present Proxima is 2.18° to the southwest of Alpha Centauri. Because of Proxima Centauri's proximity to Earth, its angular diameter can be measured directly. The star is about one-seventh the diameter of the Sun. It has a mass about an eighth of the Sun's mass (M☉), and its average density is about 33 times that of the Sun. [nb 2] Although it has a very low average luminosity, Proxima is a flare star that undergoes random dramatic increases in brightness because of magnetic activity. The star's magnetic field is created by convection throughout the stellar body, and the resulting flare activity generates a total X-ray emission similar to that produced by the Sun. The mixing of the fuel at Proxima Centauri's core through convection and its relatively low energy-production rate mean that it will be a main-sequence star for another four trillion years, or nearly 300 times the current age of the universe. In 2016, the European Southern Observatory announced the discovery of Proxima Centauri b, a planet orbiting the star at a distance of roughly 0.05 AU (7.5 million km) with an orbital period of approximately 11.2 Earth days. Its estimated mass is at least 1.3 times that of the Earth. 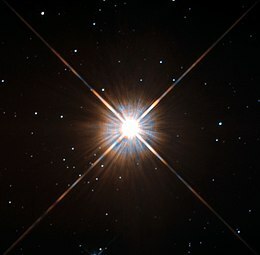 The equilibrium temperature of Proxima b is estimated to be within the range of where water could exist as liquid on its surface, thus placing it within the habitable zone of Proxima Centauri, although because Proxima Centauri is a red dwarf and a flare star, whether it could support life is disputed. Previous searches for orbiting companions had ruled out the presence of brown dwarfs and supermassive planets. In 1915, the Scottish astronomer Robert Innes, Director of the Union Observatory in Johannesburg, South Africa, discovered a star that had the same proper motion as Alpha Centauri. He suggested that it be named Proxima Centauri (actually Proxima Centaurus). In 1917, at the Royal Observatory at the Cape of Good Hope, the Dutch astronomer Joan Voûte measured the star's trigonometric parallax at 6994366034329237700♠0.755″±0.028″ and determined that Proxima Centauri was approximately the same distance from the Sun as Alpha Centauri. It was also found to be the lowest-luminosity star known at the time. An equally accurate parallax determination of Proxima Centauri was made by American astronomer Harold L. Alden in 1928, who confirmed Innes's view that it is closer, with a parallax of 6994379609112308767♠0.783″±0.005″. In 1951, American astronomer Harlow Shapley announced that Proxima Centauri is a flare star. Examination of past photographic records showed that the star displayed a measurable increase in magnitude on about 8% of the images, making it the most active flare star then known. The proximity of the star allows for detailed observation of its flare activity. In 1980, the Einstein Observatory produced a detailed X-ray energy curve of a stellar flare on Proxima Centauri. Further observations of flare activity were made with the EXOSAT and ROSAT satellites, and the X-ray emissions of smaller, solar-like flares were observed by the Japanese ASCA satellite in 1995. Proxima Centauri has since been the subject of study by most X-ray observatories, including XMM-Newton and Chandra. In 2016, the International Astronomical Union organized a Working Group on Star Names (WGSN) to catalogue and standardize proper names for stars. The WGSN approved the name Proxima Centauri for this star on August 21, 2016 and it is now so included in the List of IAU approved Star Names. Because of Proxima Centauri's southern declination, it can only be viewed south of latitude 27° N.[nb 3] Red dwarfs such as Proxima Centauri are far too faint to be seen with the naked eye. Even from Alpha Centauri A or B, Proxima would only be seen as a fifth magnitude star. It has an apparent visual magnitude of 11, so a telescope with an aperture of at least 8 cm (3.1 in) is needed to observe it, even under ideal viewing conditions—under clear, dark skies with Proxima Centauri well above the horizon. In 2018, a superflare was observed from Proxima Centauri, the strongest flare ever seen. The optical brightness increased by a factor of 68 to approximately magnitude 6.8. It is estimated that similar flares occur around five times every year but are of such short duration, just a few minutes, that they have never been observed before. Proxima Centauri is a red dwarf, because it belongs to the main sequence on the Hertzsprung–Russell diagram and is of spectral class M5.5. M5.5 means that it falls in the low-mass end of M-type stars. Its absolute visual magnitude, or its visual magnitude as viewed from a distance of 10 parsecs (33 ly), is 15.5. Its total luminosity over all wavelengths is 0.17% that of the Sun, although when observed in the wavelengths of visible light the eye is most sensitive to, it is only 0.0056% as luminous as the Sun. More than 85% of its radiated power is at infrared wavelengths. It has a regular activity cycle of starspots. A 1998 study of photometric variations indicates that Proxima Centauri rotates once every 83.5 days. A subsequent time series analysis of chromospheric indicators in 2002 suggests a longer rotation period of 7002116600000000000♠116.6±0.7 days. This was subsequently ruled out in favor of a rotation period of 7001826000000000000♠82.6±0.1 days. Convection is associated with the generation and persistence of a magnetic field. The magnetic energy from this field is released at the surface through stellar flares that briefly increase the overall luminosity of the star. These flares can grow as large as the star and reach temperatures measured as high as 27 million K—hot enough to radiate X-rays. Proxima Centauri's quiescent X-ray luminosity, approximately (4–16) × 1026 erg/s ((4–16) × 1019 W), is roughly equal to that of the much larger Sun. The peak X-ray luminosity of the largest flares can reach 1028 erg/s (1021 W). Based on a parallax of 6994372399932870668♠768.13±1.04 mas, published in 2014 by the Research Consortium On Nearby Stars, Proxima Centauri is about 4.246 light-years (1.302 pc; 268,500 AU) from the Sun. Previously published parallaxes include 6994374436150331328♠772.33±2.42 mas in the Hipparcos Catalogue (1997) and 6994372710213626578♠768.77±0.37 mas using the Hubble Space Telescope's Fine Guidance Sensors (1999). From Earth's vantage point, Proxima is separated from Alpha Centauri by 2.18 degrees, or four times the angular diameter of the full Moon. Proxima also has a relatively large proper motion—moving 3.85 arcseconds per year across the sky. It has a radial velocity toward the Sun of 22.2 km/s. Among the known stars, Proxima Centauri has been the closest star to the Sun for about 32,000 years and will be so for about another 25,000 years, after which Alpha Centauri A and Alpha Centauri B will alternate approximately every 79.91 years as the closest star to the Sun. In 2001, J. García-Sánchez et al. predicted that Proxima will make its closest approach to the Sun in approximately 26,700 years, coming within 3.11 ly (0.95 pc). A 2010 study by V. V. Bobylev predicted a closest approach distance of 2.90 ly (0.89 pc) in about 27,400 years, followed by a 2014 study by C. A. L. Bailer-Jones predicting a perihelion approach of 3.07 ly (0.94 pc) in roughly 26,710 years. Proxima Centauri is orbiting through the Milky Way at a distance from the Galactic Centre that varies from 27 to 31 kly (8.3 to 9.5 kpc), with an orbital eccentricity of 0.07. −100 AU at apastron. At present, Proxima is 12,947 ± 260 AU (1.94 ± 0.04 trillion km) from the Alpha Centauri AB barycenter, nearly to the farthest point in its orbit. Such a triple system can form naturally through a low-mass star being dynamically captured by a more massive binary of 1.5–2 M☉ within their embedded star cluster before the cluster disperses. However, more accurate measurements of the radial velocity are needed to confirm this hypothesis. If Proxima was bound to the Alpha Centauri system during its formation, the stars are likely to share the same elemental composition. The gravitational influence of Proxima might also have stirred up the Alpha Centauri protoplanetary disks. This would have increased the delivery of volatiles such as water to the dry inner regions, so possibly enriching any terrestrial planets in the system with this material. Alternatively, Proxima may have been captured at a later date during an encounter, resulting in a highly eccentric orbit that was then stabilized by the galactic tide and additional stellar encounters. Such a scenario may mean that Proxima's planetary companion has had a much lower chance for orbital disruption by Alpha Centauri. Six single stars, two binary star systems, and a triple star share a common motion through space with Proxima Centauri and the Alpha Centauri system. The space velocities of these stars are all within 10 km/s of Alpha Centauri's peculiar motion. Thus, they may form a moving group of stars, which would indicate a common point of origin, such as in a star cluster. Though Proxima Centauri is the nearest bona fide star, it is still possible that one or more as-yet undetected sub-stellar brown dwarfs may lie closer. The first indications of the exoplanet Proxima Centauri b were found in 2013 by Mikko Tuomi of the University of Hertfordshire from archival observation data. To confirm the possible discovery, the European Southern Observatory launched the Pale Red Dot[nb 5] project in January 2016. On August 24, 2016, the team of 31 scientists from all around the world, led by Guillem Anglada-Escudé of Queen Mary University of London, confirmed the existence of Proxima Centauri b through a peer-reviewed article published in Nature. The measurements were performed using two spectrographs: HARPS on the ESO 3.6 m Telescope at La Silla Observatory and UVES on the 8 m Very Large Telescope at Paranal Observatory. Several attempts to detect a transit of this planet across the face of Proxima Centauri have been made. A transit-like signal appearing on September 8, 2016 was tentatively identified, using the Bright Star Survey Telescope at the Zhongshan Station in Antarctica. Proxima Centauri b, or Alpha Centauri Cb, is a planet orbiting the star at a distance of roughly 0.05 AU (7.5 million km) with an orbital period of approximately 11.2 Earth days. Its estimated mass is at least 1.3 times that of the Earth. Moreover, the equilibrium temperature of Proxima b is estimated to be within the range where water could exist as liquid on its surface; thus, placing it within the habitable zone of Proxima Centauri. Prior to this discovery, multiple measurements of the star's radial velocity constrained the maximum mass that a detectable companion to Proxima Centauri could possess. The activity level of the star adds noise to the radial velocity measurements, complicating detection of a companion using this method. In 1998, an examination of Proxima Centauri using the Faint Object Spectrograph on board the Hubble Space Telescope appeared to show evidence of a companion orbiting at a distance of about 0.5 AU. A subsequent search using the Wide Field Planetary Camera 2 failed to locate any companions. Astrometric measurements at the Cerro Tololo Inter-American Observatory appear to rule out a Jupiter-sized planet with an orbital period of 2−12 years. A second signal in the range of 60 to 500 days was also detected, but its nature is still unclear due to stellar activity. A candidate second planet orbiting Proxima Centauri was reported by Italian astrophysicist Mario Damasso and his colleagues in April 2019. Damasso's team had noticed minor movements of Proxima Centauri in the radial velocity data from the ESO's HARPS instrument, indicating a possible additional planet orbiting Proxima Centauri. Dubbed Proxima c, the exoplanet is estimated to have a minimum mass of six times that of Earth. It is expected to orbit Proxima Centauri at a distance of 1.5 AU, with an orbital period of roughly 1900 days, or about 5.2 years. Due to its large distance from Proxima Centauri, the exoplanet is expected to be uninhabitable, with a low equilibrium temperature of around 39 K. Additional observations and measurements from the HARPS instrument and the European Space Agency's Gaia spacecraft are needed to verify the existence of the possible exoplanet. Del Sordo of Damasso's team states that Proxima c could provide opportunities for further observations of the Proxima Centauri planetary system, especially by direct imaging. Proxima Centauri, along with Alpha Centauri A and B, was among the "Tier 1" target stars for NASA's now-canceled Space Interferometry Mission (SIM), which would theoretically have been able to detect planets as small as three Earth masses (M⊕) within two AU of a "Tier 1" target star. In 2017, a team of astronomers using the Atacama Large Millimeter/submillimeter Array reported detecting a belt of dust orbiting Proxima Centauri at a range of 1−4 AU from the star. This dust has a temperature of around 40 K and has a total estimated mass of 1% of the planet Earth. They also tentatively detected two additional features: a cold belt with a temperature of 10 K orbiting around 30 AU and a compact emission source about 1.2 arcseconds from the star. However, upon further analysis, these emissions were determined to be the result of a large flare emitted by the star in March, 2017. The presence of dust is not needed to model the observations. Prior to the discovery of Proxima Centauri b, the TV documentary Alien Worlds hypothesized that a life-sustaining planet could exist in orbit around Proxima Centauri or other red dwarfs. Such a planet would lie within the habitable zone of Proxima Centauri, about 0.023–0.054 AU (3.4–8.1 million km) from the star, and would have an orbital period of 3.6–14 days. A planet orbiting within this zone may experience tidal locking to the star. If the orbital eccentricity of this hypothetical planet is low, Proxima Centauri would move little in the planet's sky, and most of the surface would experience either day or night perpetually. The presence of an atmosphere could serve to redistribute the energy from the star-lit side to the far side of the planet. Proxima Centauri's flare outbursts could erode the atmosphere of any planet in its habitable zone, but the documentary's scientists thought that this obstacle could be overcome. Gibor Basri of the University of California, Berkeley, mentioned that "no one [has] found any showstoppers to habitability". For example, one concern was that the torrents of charged particles from the star's flares could strip the atmosphere off any nearby planet. If the planet had a strong magnetic field, the field would deflect the particles from the atmosphere; even the slow rotation of a tidally locked planet that spins once for every time it orbits its star would be enough to generate a magnetic field, as long as part of the planet's interior remained molten. Other scientists, especially proponents of the rare-Earth hypothesis, disagree that red dwarfs can sustain life. Any exoplanet in this star's habitable zone would likely be tidally locked, resulting in a relatively weak planetary magnetic moment, leading to strong atmospheric erosion by coronal mass ejections from Proxima Centauri. Project Breakthrough Starshot aims to reach the Alpha Centauri system within the first half of the 21st century, with microprobes travelling at 20% of the speed of light propelled by around 100 gigawatts of Earth-based lasers. The probes will perform a fly-by of Proxima Centauri to take photos and collect data of its planet's atmospheric composition. It will take 4.22 years for the information collected to be sent back to Earth. ^ Note that by the time Proxima gets to the 40,000-year mark, the entire Alpha Centauri system will have moved to another part of the sky, so the perspective and background will be different. ^ This is actually an upper limit on the quantity m sin i, where i is the angle between the orbit normal and the line of sight, in a circular orbit. If the planetary orbits are close to face-on as observed from Earth, or in an eccentric orbit, more massive planets could have evaded detection by the radial velocity method. ^ The coordinates of the Sun would be diametrically opposite Proxima, at α= 02h 29m 42.9487s, δ=+62° 40′ 46.141″. The absolute magnitude Mv of the Sun is 4.83, so at a parallax π of 0.77199 the apparent magnitude m is given by 4.83 − 5(log10(0.77199) + 1) = 0.40. See: Tayler, Roger John (1994). The Stars: Their Structure and Evolution. Cambridge University Press. p. 16. ISBN 978-0-521-45885-6. ^ a b Stevenson, Angus, ed. (2010), Oxford Dictionary of English, OUP Oxford, p. 1431, ISBN 978-0199571123. ^ a b Samus, N. N.; Durlevich, O. V.; et al. (2009). "VizieR online data catalog: General catalogue of variable stars (Samus+ 2007–2013)". VizieR On-line Data Catalog: B/gcvs. Originally Published In: 2009yCat....102025S. 1. Bibcode:2009yCat....102025S. ^ Bessell, M. S. (1991). "The late-M dwarfs". The Astronomical Journal. 101: 662. Bibcode:1991AJ....101..662B. doi:10.1086/115714. ^ a b c d e f Jao, Wei-Chun; Henry, Todd J.; Subasavage, John P.; Winters, Jennifer G.; Gies, Douglas R.; Riedel, Adric R.; Ianna, Philip A. (2014). "The Solar neighborhood. XXXI. Discovery of an unusual red+white dwarf binary at ~25 pc via astrometry and UV imaging". The Astronomical Journal. 147 (1): 21. arXiv:1310.4746. Bibcode:2014AJ....147...21J. doi:10.1088/0004-6256/147/1/21. ISSN 0004-6256. ^ a b c Cutri, R. M.; Skrutskie, M. F.; Van Dyk, S.; Beichman, C. A.; Carpenter, J. M.; Chester, T.; Cambresy, L.; Evans, T.; Fowler, J.; Gizis, J.; Howard, E.; Huchra, J.; Jarrett, T.; Kopan, E. L.; Kirkpatrick, J. D.; Light, R. M.; Marsh, K. A.; McCallon, H.; Schneider, S.; Stiening, R.; Sykes, M.; Weinberg, M.; Wheaton, W. A.; Wheelock, S.; Zacarias, N. (2003). "VizieR online data catalog: 2MASS all-sky catalog of point sources (Cutri+ 2003)". VizieR On-line Data Catalog: II/246. Originally Published In: 2003yCat.2246....0C. 2246: 0. Bibcode:2003yCat.2246....0C. ^ a b c d e f g h i j Kervella, P.; Thévenin, F.; Lovis, C. (2017). "Proxima's orbit around α Centauri". Astronomy & Astrophysics. 598: L7. arXiv:1611.03495. Bibcode:2017A&A...598L...7K. doi:10.1051/0004-6361/201629930. ISSN 0004-6361. Separation: 3.1, left column of page 3; Orbital period and epoch of periastron: Table 3, right column of page 3. ^ a b c Brown, A. G. A.; et al. (Gaia collaboration) (August 2018). "Gaia Data Release 2: Summary of the contents and survey properties". Astronomy & Astrophysics. 616. A1. arXiv:1804.09365. Bibcode:2018A&A...616A...1G. doi:10.1051/0004-6361/201833051. ^ a b c Benedict, G. Fritz, Chappell DW, Nelan E, Jefferys WH, Van Altena W, Lee J, Cornell D, Shelus PJ (1999). "Interferometric astrometry of Proxima Centauri and Barnard's Star using Hubble Space Telescope fine guidance sensor 3: detection limits for substellar companions". The Astronomical Journal. 118 (2): 1086–1100. arXiv:astro-ph/9905318. Bibcode:1999AJ....118.1086B. doi:10.1086/300975. ^ a b See Table 1, Doyle, J. G.; Butler, C. J. (1990). "Optical and infrared photometry of dwarf M and K stars". Astronomy and Astrophysics. 235: 335–339. Bibcode:1990A&A...235..335D. and p. 57, Peebles, P. J. E. (1993). Principles of physical cosmology. Princeton, New Jersey: Princeton University Press. ISBN 978-0-691-01933-8. ^ a b c Collins, John M.; Jones, Hugh R. A.; Barnes, John R. (June 2017). "Calculations of periodicity from Hα profiles of Proxima Centauri". Astronomy & Astrophysics. 602. A48. arXiv:1608.07834. Bibcode:2017A&A...602A..48C. doi:10.1051/0004-6361/201628827. See section 4: "the vsini is probably less than 0.1 km/s for Proxima Centauri". ^ a b c d e Kervella, Pierre; Thevenin, Frederic (March 15, 2003). "A family portrait of the Alpha Centauri system: VLT interferometer studies the nearest stars". ESO. Retrieved May 10, 2016. ^ "SIMBAD query result: V* V645 Cen – Flare Star". SIMBAD. Centre de Données astronomiques de Strasbourg. Retrieved August 11, 2008. —some of the data is located under "Measurements". ^ Liewer, Paulett (February 8, 2000). "Our local galactic neighborhood". Interstellar Probe. NASA. Archived from the original on November 21, 2013. Retrieved March 22, 2013. ^ Glister, Paul (September 1, 2010). "Into the interstellar void". Centauri Dreams. Retrieved March 22, 2013. ^ a b Kirkpatrick JD, Davy J, Monet DG, Reid IN, Gizis JE, Liebert J, Burgasser AJ (2001). "Brown dwarf companions to G-type stars. I: Gliese 417B and Gliese 584C". The Astronomical Journal. 121 (6): 3235–3253. arXiv:astro-ph/0103218. Bibcode:2001AJ....121.3235K. doi:10.1086/321085. ^ Christian, D. J.; Mathioudakis, M.; Bloomfield, D. S.; Dupuis, J.; Keenan, F. P. (2004). "A detailed study of opacity in the upper atmosphere of Proxima Centauri". The Astrophysical Journal. 612 (2): 1140–1146. Bibcode:2004ApJ...612.1140C. doi:10.1086/422803. ^ a b Wood, B. E.; Linsky, J. L.; Müller, H.-R.; Zank, G. P. (2001). "Observational estimates for the mass-loss rates of α Centauri and Proxima Centauri using Hubble Space Telescope Lyα spectra" (PDF). The Astrophysical Journal. 547 (1): L49–L52. arXiv:astro-ph/0011153. Bibcode:2001ApJ...547L..49W. doi:10.1086/318888. Retrieved July 9, 2007. ^ a b c Adams, Fred C.; Laughlin, Gregory; Graves, Genevieve J. M. Red dwarfs and the end of the main sequence (PDF). Gravitational collapse: from massive stars to planets. Revista Mexicana de Astronomía y Astrofísica. pp. 46–49. Retrieved June 24, 2008. ^ Dunkley, J.; Komatsu, E.; Nolta, M. R.; Spergel, D. N.; Larson, D.; Hinshaw, G.; Page, L.; Bennett, C. L.; Gold, B. (2009). "Five-year Wilkinson microwave anisotropy probe (WMAP) observations: data processing, sky maps, and basic results". The Astrophysical Journal Supplement Series. 180 (2): 306–329. arXiv:0803.0586. Bibcode:2009ApJS..180..306D. doi:10.1088/0067-0049/180/2/306. ^ a b c d e f g Anglada-Escudé, Guillem; Amado, Pedro J.; Barnes, John; Berdiñas, Zaira M.; Butler, R. Paul; Coleman, Gavin A. L.; de la Cueva, Ignacio; Dreizler, Stefan; Endl, Michael; Giesers, Benjamin; Jeffers, Sandra V.; Jenkins, James S.; Jones, Hugh R. A.; Kiraga, Marcin; Kürster, Martin; López-González, Marίa J.; Marvin, Christopher J.; Morales, Nicolás; Morin, Julien; Nelson, Richard P.; Ortiz, José L.; Ofir, Aviv; Paardekooper, Sijme-Jan; Reiners, Ansgar; Rodríguez, Eloy; Rodrίguez-López, Cristina; Sarmiento, Luis F.; Strachan, John P.; Tsapras, Yiannis; Tuomi, Mikko; Zechmeister, Mathias (August 25, 2016), "A terrestrial planet candidate in a temperate orbit around Proxima Centauri" (PDF), Nature, 536 (7617): 437–440, arXiv:1609.03449, Bibcode:2016Natur.536..437A, doi:10.1038/nature19106, PMID 27558064, retrieved August 24, 2016. ^ "Planet found in habitable zone around nearest star". European Southern Observatory. August 24, 2016. Retrieved September 6, 2016. ^ "Found! Potentially Earth-like planet at Proxima Centauri is closest ever". Space.com. April 24, 2016. ^ a b Chang, Kenneth (August 24, 2016). "One star over, a planet that might be another Earth". New York Times. Retrieved August 24, 2016. ^ a b Knapton, Sarah (August 24, 2016). "Proxima b: Alien life could exist on 'second Earth' found orbiting our nearest star in Alpha Centauri system". The Telegraph. Telegraph Media Group. Retrieved August 24, 2016. ^ a b Tarter, Jill C., Mancinelli RL, Aurnou JM, Backman DE, Basri GS, Boss AP, Clarke A, Deming D (2007). "A reappraisal of the habitability of planets around M dwarf stars". Astrobiology. 7 (1): 30–65. arXiv:astro-ph/0609799. Bibcode:2007AsBio...7...30T. doi:10.1089/ast.2006.0124. PMID 17407403. ^ a b Khodachenko, Maxim L., Lammer H, Grießmeier J, Leitner M, Selsis F, Eiroa C, Hanslmeier A, Biernat HK (2007). "Coronal Mass Ejection (CME) activity of low mass M stars as an important factor for the habitability of terrestrial exoplanets. I. CME impact on expected magnetospheres of earth-like exoplanets in close-in habitable zones". Astrobiology. 7 (1): 167–184. Bibcode:2007AsBio...7..167K. doi:10.1089/ast.2006.0127. PMID 17407406. ^ a b Kürster, M.; Hatzes, A. P.; Cochran, W. D.; Döbereiner, S.; Dennerl, K.; Endl, M. (1999). "Precise radial velocities of Proxima Centauri. Strong constraints on a substellar companion". Astronomy & Astrophysics Letters. 344: L5–L8. arXiv:astro-ph/9903010. Bibcode:1999A&A...344L...5K. ^ a b Schroeder, Daniel J.; Golimowski, David A.; Brukardt, Ryan A.; Burrows, Christopher J.; Caldwell, John J.; Fastie, William G.; Ford, Holland C.; Hesman, Brigette; Kletskin, Ilona; Krist, John E.; Royle, Patricia; Zubrowski, Richard. A. (2000). "A Search for Faint Companions to Nearby Stars Using the Wide Field Planetary Camera 2". The Astronomical Journal. 119 (2): 906–922. Bibcode:2000AJ....119..906S. doi:10.1086/301227. ^ Innes, R. T. A. (October 1915). "A Faint Star of Large Proper Motion". Circular of the Union Observatory Johannesburg. 30: 235–236. Bibcode:1915CiUO...30..235I. This is the original Proxima Centauri discovery paper. ^ a b Glass, I. S. (July 2007). "The discovery of the nearest star". African Skies. 11: 39. Bibcode:2007AfrSk..11...39G. ^ Glass, I.S. (2008). Proxima, the nearest star (other than the Sun). Cape Town: Mons Mensa. Retrieved September 6, 2016. ^ Queloz, Didier (November 29, 2002). "How Small are Small Stars Really?". European Southern Observatory. eso0232; PR 22/02. Retrieved January 29, 2018. ^ a b Alden, Harold L. (1928). "Alpha and Proxima Centauri". Astronomical Journal. 39 (913): 20–23. Bibcode:1928AJ.....39...20A. doi:10.1086/104871. ^ Innes, R. T. A. (September 1917). "Parallax of the Faint Proper Motion Star Near Alpha of Centaurus. 1900. R.A. 14 h 22m 55s.-0s 6t. Dec-62° 15'2 0'8 t". Circular of the Union Observatory Johannesburg. 40: 331–336. Bibcode:1917CiUO...40..331I. ^ Voûte, J. (1917). "A 13th magnitude star in Centaurus with the same parallax as α Centauri". Monthly Notices of the Royal Astronomical Society. 77 (9): 650–651. Bibcode:1917MNRAS..77..650V. doi:10.1093/mnras/77.9.650. ^ Clavin, Whitney; Harrington, J.D. (April 25, 2014). "NASA's Spitzer and WISE telescopes find close, cold neighbor of Sun". NASA. Archived from the original on April 26, 2014. Retrieved April 25, 2014. ^ Shapley, Harlow (1951). "Proxima Centauri as a flare star". Proceedings of the National Academy of Sciences of the United States of America. 37 (1): 15–18. Bibcode:1951PNAS...37...15S. doi:10.1073/pnas.37.1.15. PMC 1063292. PMID 16588985. ^ Kroupa, Pavel; Burman, R. R.; Blair, D. G. (1989). "Photometric observations of flares on Proxima Centauri". PASA. 8 (2): 119–122. Bibcode:1989PASAu...8..119K. doi:10.1017/S1323358000023122. ^ Haisch, Bernhard; Antunes, A.; Schmitt, J. H. M. M. (1995). "Solar-like M-class X-ray flares on Proxima Centauri observed by the ASCA satellite". Science. 268 (5215): 1327–1329. Bibcode:1995Sci...268.1327H. doi:10.1126/science.268.5215.1327. PMID 17778978. ^ a b c Guedel, M.; Audard, M.; Reale, F.; Skinner, S. L.; Linsky, J. L. (2004). "Flares from small to large: X-ray spectroscopy of Proxima Centauri with XMM-Newton". Astronomy and Astrophysics. 416 (2): 713–732. arXiv:astro-ph/0312297. Bibcode:2004A&A...416..713G. doi:10.1051/0004-6361:20031471. ^ IAU Working Group on Star Names (WGSN), International Astronomical Union, retrieved May 22, 2016. ^ "Naming Stars". IAU.org. Retrieved March 3, 2018. ^ "Proxima Centauri UV flux distribution". ESA/Laboratory for Space Astrophysics and Theoretical Physics. Retrieved July 11, 2007. ^ Kaler, Jim. "Rigil Kentaurus". University of Illinois. Retrieved August 3, 2008. ^ Sherrod, P. Clay; Koed, Thomas L. (2003). A complete manual of amateur astronomy: tools and techniques for astronomical observations. Courier Dover Publications. ISBN 978-0-486-42820-8. ^ Howard, Ward S.; Tilley, Matt A.; Corbett, Hank; Youngblood, Allison; Loyd, R. O. Parke; Ratzloff, Jeffrey K.; Law, Nicholas M.; Fors, Octavi; Del Ser, Daniel; Shkolnik, Evgenya L.; Ziegler, Carl; Goeke, Erin E.; Pietraallo, Aaron D.; Haislip, Joshua (2018). "The First Naked-eye Superflare Detected from Proxima Centauri". The Astrophysical Journal. 860 (2): L30. arXiv:1804.02001. Bibcode:2018ApJ...860L..30H. doi:10.3847/2041-8213/aacaf3. ^ Kamper, K. W.; Wesselink, A. J. (1978). "Alpha and Proxima Centauri". Astronomical Journal. 83: 1653–1659. Bibcode:1978AJ.....83.1653K. doi:10.1086/112378. ^ Binney, James; Scott Tremaine (1987). Galactic dynamics. Princeton, New Jersey: Princeton University Press. p. 8. ISBN 978-0-691-08445-9. ^ Leggett, S. K. (1992). "Infrared colors of low-mass stars". Astrophysical Journal Supplement Series. 82 (1): 351–394, 357. Bibcode:1992ApJS...82..351L. doi:10.1086/191720. ^ "Proxima Centauri Might Be More Sunlike Than We Thought". Smithsonian Insider. October 12, 2016. Retrieved November 2, 2016. ^ Queloz, Didier (November 29, 2002). "How Small are Small Stars Really?". European Southern Observatory. Retrieved September 5, 2016. ^ Zurlo, A.; Gratton, R.; Mesa, D.; Desidera, S.; Enia, A.; Sahu, K.; Almenara, J. -M.; Kervella, P.; Avenhaus, H.; Girard, J.; Janson, M.; Lagadec, E.; Langlois, M.; Milli, J.; Perrot, C.; Schlieder, J. -E.; Thalmann, C.; Vigan, A.; Giro, E.; Gluck, L.; Ramos, J.; Roux, A. (2018). "The gravitational mass of Proxima Centauri measured with SPHERE from a microlensing event". Monthly Notices of the Royal Astronomical Society. 480 (1): 236. arXiv:1807.01318. Bibcode:2018MNRAS.480..236Z. doi:10.1093/mnras/sty1805. ^ Zombeck, Martin V. (2007). Handbook of space astronomy and astrophysics (Third ed.). Cambridge, UK: Cambridge University Press. p. 109. ISBN 978-0-521-78242-5. ^ Benedict, G. F., McArthur, B., Nelan E, Story D, Whipple AL, Shelus PJ, Jefferys WH, Hemenway PD, Franz OG (1998). "Photometry of Proxima Centauri and Barnard's Star using Hubble Space Telescope fine guidance sensor 3: a search for periodic variations". The Astronomical Journal. 116 (1): 429–439. arXiv:astro-ph/9806276. Bibcode:1998AJ....116..429B. doi:10.1086/300420. ^ Suárez Mascareño, A.; Rebolo, R.; González Hernández, J. I.; Esposito, M. (September 2015). "Rotation periods of late-type dwarf stars from time series high-resolution spectroscopy of chromospheric indicators". Monthly Notices of the Royal Astronomical Society. 452 (3): 2745–2756. arXiv:1506.08039. Bibcode:2015MNRAS.452.2745S. doi:10.1093/mnras/stv1441. ^ Yadav, Rakesh K.; et al. (December 2016). "Magnetic Cycles in a Dynamo Simulation of Fully Convective M-star Proxima Centauri". The Astrophysical Journal Letters. 833 (2): 6. Bibcode:2016ApJ...833L..28Y. doi:10.3847/2041-8213/833/2/L28. L28. ^ Staff (August 30, 2006). "Proxima Centauri: the nearest star to the Sun". Harvard-Smithsonian Center for Astrophysics. Retrieved July 9, 2007. ^ E. F., Guinan; Morgan, N. D. (1996). "Proxima Centauri: rotation, chromospheric activity, and flares". Bulletin of the American Astronomical Society. 28: 942. Bibcode:1996AAS...188.7105G. ^ Wargelin, Bradford J.; Drake, Jeremy J. (2002). "Stringent X-ray constraints on mass loss from Proxima Centauri". The Astrophysical Journal. 578 (1): 503–514. Bibcode:2002ApJ...578..503W. doi:10.1086/342270. ^ Stauffer, J. R.; Hartmann, L. W. (1986). "Chromospheric activity, kinematics, and metallicities of nearby M dwarfs". Astrophysical Journal Supplement Series. 61 (2): 531–568. Bibcode:1986ApJS...61..531S. doi:10.1086/191123. ^ Cincunegui, C.; Díaz, R. F.; Mauas, P. J. D. (2007). "A possible activity cycle in Proxima Centauri". Astronomy and Astrophysics. 461 (3): 1107–1113. arXiv:astro-ph/0703514. Bibcode:2007A&A...461.1107C. doi:10.1051/0004-6361:20066027. ^ Wood, B. E.; Linsky, J. L.; Muller, H.-R.; Zank, G. P. (2000). "Observational estimates for the mass-loss rates of Alpha Centauri and Proxima Centauri using Hubble Space Telescope Lyman-alpha spectra". Astrophysical Journal. 537 (2): L49–L52. arXiv:astro-ph/0011153. Bibcode:2000ApJ...537..304W. doi:10.1086/309026. ^ Perryman, M. A. C.; Lindegren, L.; Kovalevsky, J.; Hoeg, E.; Bastian, U.; Bernacca, P. L.; Crézé, M.; Donati, F.; Grenon, M.; Grewing, M.; van Leeuwen, F.; van der Marel, H.; Mignard, F.; Murray, C. A.; Le Poole, R. S.; Schrijver, H.; Turon, C.; Arenou, F.; Froeschlé, M.; Petersen, C. S. (July 1997), "The Hipparcos catalogue", Astronomy and Astrophysics, 323: L49–L52, Bibcode:1997A&A...323L..49P. ^ Williams, D. R. (February 10, 2006). "Moon fact sheet". NASA. Retrieved October 12, 2007. ^ Benedict, G. F.; Mcarthur, B.; Nelan, E.; Story, D.; Jefferys, W. H.; Wang, Q.; Shelus, P. J.; Hemenway, P. D.; Mccartney, J.; Van Altena, Wm. F.; Duncombe, R.; Franz, O. G.; Fredrick, L. W. Astrometric stability and precision of fine guidance sensor #3: the parallax and proper motion of Proxima Centauri (PDF). Proceedings of the HST calibration workshop. pp. 380–384. Retrieved July 11, 2007. ^ a b García-Sánchez, J.; Weissman, P. R.; Preston, R. A.; Jones, D. L.; Lestrade, J.-F.; Latham, D. W.; Stefanik, R. P.; Paredes, J. M. (2001). "Stellar encounters with the solar system" (PDF). Astronomy and Astrophysics. 379 (2): 634–659. Bibcode:2001A&A...379..634G. doi:10.1051/0004-6361:20011330. ^ Bobylev, V. V. (March 2010). "Searching for stars closely encountering with the solar system". Astronomy Letters. 36 (3): 220–226. arXiv:1003.2160. Bibcode:2010AstL...36..220B. doi:10.1134/S1063773710030060. ^ Allen, C.; Herrera, M. A. (1998). "The galactic orbits of nearby UV Ceti stars". Revista Mexicana de Astronomia y Astrofisica. 34: 37–46. Bibcode:1998RMxAA..34...37A. ^ Grimley, Peter (December 22, 2016). "Orbit of Proxima Centauri Determined After 100 Years". European Southern Observatory. Retrieved December 26, 2016. ^ Kroupa, Pavel (1995). "The dynamical properties of stellar systems in the Galactic disc". MNRAS. 277 (4): 1507–1521. arXiv:astro-ph/9508084. Bibcode:1995MNRAS.277.1507K. doi:10.1093/mnras/277.4.1507. ^ a b Wertheimer, Jeremy G.; Laughlin, Gregory (2006). "Are Proxima and α Centauri gravitationally bound?". The Astronomical Journal. 132 (5): 1995–1997. arXiv:astro-ph/0607401. Bibcode:2006AJ....132.1995W. doi:10.1086/507771. ^ Feng, F.; Jones, H. R. A. (January 2018), "Was Proxima captured by Alpha Centauri A and B? ", Monthly Notices of the Royal Astronomical Society, 473 (3): 3185−3189, arXiv:1709.03560, Bibcode:2018MNRAS.473.3185F, doi:10.1093/mnras/stx2576. ^ Johnston, Kathryn V.; Hernquist, Lars; Bolte, Michael (1996). "Fossil signatures of ancient accretion events in the halo". The Astrophysical Journal. 465: 278. arXiv:astro-ph/9602060. Bibcode:1996ApJ...465..278J. doi:10.1086/177418. ^ Matson, John (December 9, 2009). "WISE satellite set to map the infrared universe". Scientific American. Retrieved December 10, 2009. ^ Li, Yiting; et al. (December 14, 2017). "A Candidate Transit Event around Proxima Centauri". Research Notes of the AAS. 1 (1). 49. arXiv:1712.04483. Bibcode:2017RNAAS...1a..49L. doi:10.3847/2515-5172/aaa0d5. ^ a b c d e f g Wall, Mike (April 12, 2019). "Possible 2nd Planet Spotted Around Proxima Centauri". Space.com. Retrieved April 12, 2019. ^ Bixel, A.; Apai, D. (February 21, 2017). "Probabilistic Constraints on the Mass and Composition of Proxima b". The Astrophysical Journal Letters. 836 (2): L31. arXiv:1702.02542. Bibcode:2017ApJ...836L..31W. doi:10.3847/2041-8213/aa5f51. hdl:10150/623234. ISSN 2041-8205. ^ "Proxima b is our neighbor ... better get used to it!". Pale Red Dot. August 24, 2016. Retrieved August 24, 2016. ^ "Follow a Live Planet Hunt!". European Southern Observatory. January 15, 2016. Retrieved August 24, 2016. ^ Feltman, Rachel (August 24, 2016). "Scientists say they've found a planet orbiting Proxima Centauri, our closest neighbor". The Washington Post – via GALE. ^ Mathewson, Samantha (August 24, 2016). "Proxima b By the Numbers: Possibly Earth-Like World at the Next Star Over". Space.com. Retrieved August 25, 2016. ^ Witze, Alexandra (August 24, 2016). "Earth-sized planet around nearby star is astronomy dream come true". Nature. pp. 381–382. Bibcode:2016Natur.536..381W. doi:10.1038/nature.2016.20445. Retrieved August 24, 2016. ^ Liu, Hui-Gen; et al. (January 2018), "Searching for the Transit of the Earth-mass Exoplanet Proxima Centauri b in Antarctica: Preliminary Result", The Astronomical Journal, 155 (1): 10, arXiv:1711.07018, Bibcode:2018AJ....155...12L, doi:10.3847/1538-3881/aa9b86, 12. ^ Endl, M. & Kürster, M. (2008). "Toward detection of terrestrial planets in the habitable zone of our closest neighbor: Proxima Centauri". Astronomy and Astrophysics. 488 (3): 1149–1153. arXiv:0807.1452. Bibcode:2008A&A...488.1149E. doi:10.1051/0004-6361:200810058. ^ Saar, Steven H.; Donahue, Robert A. (1997). "Activity-related Radial Velocity Variation in Cool Stars". Astrophysical Journal. 485 (1): 319–326. Bibcode:1997ApJ...485..319S. doi:10.1086/304392. ^ Schultz, A. B.; Hart, H. M.; Hershey, J. L.; Hamilton, F. C.; Kochte, M.; Bruhweiler, F. C.; Benedict, G. F.; Caldwell, John; Cunningham, C.; Wu, Nailong; Franz, O. G.; Keyes, C. D.; Brandt, J. C. (1998). "A possible companion to Proxima Centauri". Astronomical Journal. 115 (1): 345–350. Bibcode:1998AJ....115..345S. doi:10.1086/300176. ^ Lurie, John C.; Henry, Todd J.; Jao, Wei-Chun; Quinn, Samuel N.; Winters, Jennifer G.; Ianna, Philip A.; Koerner, David W.; Riedel, Adric R.; Subasavage, John P. (November 2014). "The Solar Neighborhood. XXXIV. a Search for Planets Orbiting Nearby M Dwarfs Using Astrometry". The Astronomical Journal. 148 (5): 12. arXiv:1407.4820. Bibcode:2014AJ....148...91L. doi:10.1088/0004-6256/148/5/91. 91. ^ a b c Billings, Lee (April 12, 2019). "A Second Planet May Orbit Earth's Nearest Neighboring Star". Scientific American. Retrieved April 12, 2019. ^ Watanabe, Susan (October 18, 2006). "Planet-Finding by Numbers". NASA JPL. Retrieved July 9, 2007. ^ Anglada, Guillem; Amado, Pedro J; Ortiz, Jose L; Gómez, José F; Macías, Enrique; Alberdi, Antxon; Osorio, Mayra; Gómez, José L; Itziar de Gregorio-Monsalvo; Pérez-Torres, Miguel A; Anglada-Escudé, Guillem; Berdiñas, Zaira M; Jenkins, James S; Jimenez-Serra, Izaskun; Lara, Luisa M; López-González, Maria J; López-Puertas, Manuel; Morales, Nicolas; Ribas, Ignasi; Richards, Anita M. S; Rodríguez-López, Cristina; Rodriguez, Eloy (2017). "ALMA Discovery of Dust Belts Around Proxima Centauri". The Astrophysical Journal. 850 (1): L6. arXiv:1711.00578. Bibcode:2017ApJ...850L...6A. doi:10.3847/2041-8213/aa978b. ^ "Proxima Centauri's no good, very bad day". Science Daily. February 26, 2018. Retrieved March 1, 2018. ^ MacGregor, Meredith A.; et al. (2018). "Detection of a Millimeter Flare From Proxima Centauri". Astrophysical Journal Letters. 855 (1): L2. arXiv:1802.08257. Bibcode:2018ApJ...855L...2M. doi:10.3847/2041-8213/aaad6b. ^ Sandu, Oana; Hook, Richard (January 15, 2016). "Follow a live planet hunt!". European Southern Observatory. Retrieved January 18, 2016. ^ Endl, M.; Kuerster, M.; Rouesnel, F.; Els, S.; Hatzes, A. P.; Cochran, W. D. (June 18–21, 2002). Deming, Drake (ed.). Extrasolar terrestrial planets: can we detect them already?. Conference Proceedings, Scientific Frontiers in Research on Extrasolar Planets. Washington, DC. pp. 75–79. arXiv:astro-ph/0208462. Bibcode:2003ASPC..294...75E. ^ Alpert, Mark (November 2005). "Red star rising". Scientific American. 293 (5): 28. doi:10.1038/scientificamerican1105-28. PMID 16318021. Retrieved May 19, 2008. ^ Ward, Peter D.; Brownlee, Donald (2000). Rare Earth: why complex life is uncommon in the universe. Springer Publishing. ISBN 978-0-387-98701-9. ^ Gilster, Paul (2004). Centauri dreams: imagining and planning. Springer. ISBN 978-0-387-00436-5. ^ Crawford, I. A. (September 1990). "Interstellar Travel: A Review for Astronomers". Quarterly Journal of the Royal Astronomical Society. 31: 377–400. Bibcode:1990QJRAS..31..377C. ^ "Spacecraft escaping the Solar System", Heavens Above, retrieved December 25, 2016. ^ a b Beals, K. A.; Beaulieu, M.; Dembia, F. J.; Kerstiens, J.; Kramer, D. L.; West, J. R.; Zito, J. A. (1988). "Project Longshot, an Unmanned Probe to Alpha Centauri" (PDF). NASA-CR-184718. U. S. Naval Academy. Retrieved June 13, 2008. ^ Merali, Zeeya (May 27, 2016). "Shooting for a star". Science. 352 (6289): 1040–1041. doi:10.1126/science.352.6289.1040. PMID 27230357. ^ Popkin, Gabriel (February 2, 2017). "What it would take to reach the stars". Nature. 542 (7639): 20–22. Bibcode:2017Natur.542...20P. doi:10.1038/542020a. PMID 28150784. Cite error: A list-defined reference named "Cambridge2011" is not used in the content (see the help page). Wikimedia Commons has media related to Proxima Centauri. Nemiroff, R.; Bonnell, J., eds. (July 15, 2002). "Proxima Centauri: the closest star". Astronomy Picture of the Day. NASA. Retrieved June 25, 2008. "Wikisky image of Proxima Centauri". Retrieved July 1, 2017.